A year ago in October, Jim Lighthizer asked for funds to purchase "319 acres of hallowed ground at Frayser’s Farm / Glendale, just outside of Richmond, Virginia, at a total purchase price of $4.1 million." A year later he explains the good news and bad news of the situation on The Civil War Preservation Trust's website. "The good news is that you and your fellow members have been so generous that we have been able to raise $3 million of the $4.1 million. The bad news is that – with the economy as it is right now, and with the downturn in year-end giving I am already bracing for – I am concerned about what will happen if we cannot raise the remaining $1.1 million by June 2009, just eight months away. That is when we must make our final payments to the landowners, who already generously gave us two years interest-free to give us time to raise funds to save this hallowed ground." "First, while I cannot divulge any details just yet, I can tell you it is possible – even likely – that we will have an opportunity to save even more core hallowed ground at Glendale in 2009, pushing us even closer to completely saving this battlefield. Second, the developers are in a frenzy to buy open land right now. Here is a copy of yet another letter we recently received from a sneaky developer (posing as a local individual buyer, complete with computer-generated handwriting), offering to purchase part of the Glendale battlefield from us! You know if they are targeting us, they are targeting the other local landowners, too! The pressure is on! And while we pride ourselves on being able to multiply your generosity through matching grants, Glendale presents its own challenges. Let me explain . . .
"So where does that leave us? It means if the heart of the Glendale battlefield is going to be truly saved for future generations to learn from and enjoy, just as you and I enjoy Vicksburg or Antietam today . . . then you and I are going to have to save it on our own." CWL: The Pennsylvania Reserve Division was in the middle of the battle. As a matter of fact, the Rebel with the flag on the Union artillery piece was shot to death within seconds of getting on the canon by the Pennsylvania Reserve regiments. CWL happens to be a Pennsylvania Reserve reenactor; the Ninth Pennsylvania Reserves, a reenactment unit founded in 1981, of which I am on the executive board, contributed $100 to the CWPT in January of this year for the Glendale battlefield. I'll ask the unit again to send another $100 this year. News---2009: Happy 200th Birthday Mr. President! Myriad Events Planned to Honor 16th President, Michael E. Ruane, Washington Post,October 31, 2008. The items he had in his pockets the night he was assassinated. The bullet that killed him. The pearl jewelry his wife wore. The kind of oysters he liked to eat. His speeches, sayings, health, clothing. The 60 books about him set to be published in the next 18 months. Abraham Lincoln, who carried a penknife, wore a patched vest and mended his eyeglasses with string, would have been mortified at the fuss. But starting next week, the District will kick off its part of the year-long global celebration of the 200th anniversary of his birth on Feb. 12, 1809. No aspect of his existence, it seems, will go unexplored. Yesterday, tourism, museum and government officials previewed some of the 80 exhibits, lectures, tours and programs that will be part of the city's celebration of the Lincoln Bicentennial, "Living the Legacy: Lincoln in Washington DC." The preview, at the Smithsonian Institution's American Art Museum and National Portrait Gallery, was attended by two Lincoln impersonators, who noted that 50 "top hats" from their Association of Lincoln Presenters will be coming to town for their annual convention in April. "It would be nice to have him back," impersonator Jim Rubin, a retired psychologist from Prosperity, W.Va., said of the 16th president. Despite his whiskers, Rubin looked as much like Franklin D. Roosevelt as he did like Lincoln. Washington has a vast trove of Lincoln artifacts and much of it is being pulled from archives, to be scrutinized, bathed and readied for what is likely to be a focal point of the bicentennial. The Library of Congress, for example, has the Lincoln presidential papers. It has a set of first lady Mary Todd Lincoln's pearl and gold jewelry. It has the penknife, mended eyeglasses, wallet and Confederate bill that Lincoln had in his pockets the night he was assassinated at Ford's Theatre on April 14, 1865. The library also has a copy of the Gettysburg Address as well as the short but moving speech Lincoln gave as president-elect when he left his home in Springfield, Ill., for Washington. These, as well as historic letters from Lincoln to his Civil War generals, will be part of a huge library exhibit opening Feb. 12. Conservators have started studying the items for display, many of which have grown fragile over the years. On Wednesday, senior paper conservator Mary Elizabeth Haude displayed a draft of the May 23, 1860, letter Lincoln penned accepting the Republican Party's presidential nomination. Haude noted that the three-paragraph letter was written with iron gall ink, which over time corrodes paper. And in places where Lincoln crossed out a word, the excess ink has eaten tiny gashes in the paper. Haude said the document would probably be bathed to remove any residual iron and perhaps patched with delicate long-fibered paper. The National Museum of American History, which reopens next month after an $85 million renovation, will display the White House copy of the Gettysburg Address, followed in January by two major Lincoln exhibitions. Next Friday, the Smithsonian's National Portrait Gallery will unveil "One Life: The Mask of Lincoln," which will feature the haunting, rarely seen original Alexander Gardner photograph of a care-worn Lincoln taken a few months before he was assassinated. Easter Sunday, April 12, will see a reenactment of opera singer Marian Anderson's 1939 performance on Easter at the Lincoln Memorial, featuring mezzo soprano and Washington native Denyce Graves. And the Lincoln Memorial will be rededicated on Memorial Day. Ford's Theatre, where the assassination took place, will reopen in February after a $50 million renovation, although its refurbished museum, containing the clothing Lincoln wore the night of his death, won't reopen until spring. The National Museum of Health & Medicine, which has the bullet that killed the president, plans an exhibit on his death. The Lincoln Cottage, on the grounds of the Armed Forces Retirement Home, which Lincoln used as a getaway, will unveil an exhibit on Lincoln collections in February. And the Smithsonian American Art Museum, on Jan. 31, will re-create Lincoln's famous second inaugural ball, which was held in the museum building March 6, 1865. There are an estimated 60 books being published about Lincoln in the next 18 months, according to the national Abraham Lincoln Bicentennial Commission. Symposiums are planned in France, England and India. Even Lincoln's food tastes will be celebrated. William A. Hanbury, president of Destination DC, said yesterday that local restaurants plan to serve a Lincoln favorite: scalloped oysters. Georgia To Build Civil War Visitor CenterResaca Battlefield State Historic Site To Open In 2010, The Citizen, October 28, 2008. In anticipation of the American Civil War’s sesquicentennial (2011-2015), the Georgia Department of Natural Resources (DNR) has broken ground on the future Resaca Battlefield State Historic Site in Gordon County. During an Oct. 27 ceremony, Civil War re-enactors fired musketry on the site for the first time in 144 years. Resaca Battlefield State Historic Site will serve as Georgia’s gateway to its numerous Civil War attractions. Located just off I-75 near the Georgia/Tennessee border, its strategic location welcomes casual visitors as well as history buffs as they enter the state — helping generate tourist dollars for not only Gordon County, but all of Georgia. According to the 2000 Georgia Traffic Flow Map, nearly 56,000 vehicles pass the site daily. 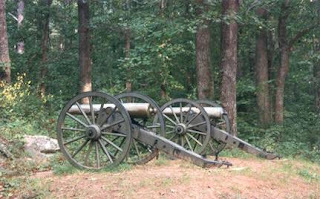 Visitors to Resaca Battlefield State Historic Site will learn about the battle of Resaca, then gather information for traveling on to Kennesaw Battlefield, Andersonville National Historic Site, Pickett’s Mill Battlefield State Historic Site, Fort McAllister Historic Park, Fort Pulaski National Monument and other locations. “Because of its location near a major interstate, this new visitor center has the potential to bring many more tourists into Georgia, generating revenue for our communities,” said State Representative John Meadows. “I’d like to particularly thank Governor Sonny Perdue, DNR Commissioner Noel Holcomb and the Friends of Resaca Battlefield for their efforts on this project.” During the ceremony, the Friends of Resaca Battlefield presented a $10,000 donation to the DNR for building the visitor center. 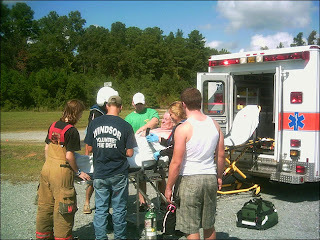 The donation was made possible in part by a grant from the Calhoun Gordon County Community Foundation, an affiliate member of the Community Foundation of Northwest Georgia. “Today’s groundbreaking ceremony is a dream come true,” said Friends President Ken Padgett. “It represents more than a decade of work by our members, state legislators and many other agencies.” Resaca Battlefield State Historic Site will open in 2010 and will include interactive displays, artifacts, retail and a theater. The project is funded with $3 million in bond funds. 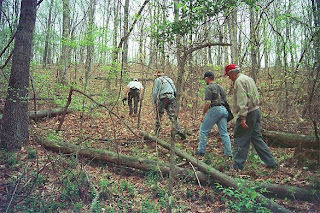 Between 2000 and 2003, the Georgia Department of Natural Resources purchased 512.85 acres of the battlefield site and has a conservation easement on an additional 61.74 acres. 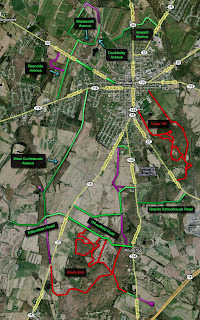 The Department of the Interior has recognized this historic battlefield as one of 25 sites chosen by the Civil War Sites Advisory Commission for funding under the American Battlefield Protection Program. Currently, there is no public access to the site. The visitor center was designed by BRPH of Marietta and will be LEED certified for environmental responsibility. Out of respect for those who fought and died at the site, the building was specifically designed to represent this particular battle. Situated near a wooded area, the low-profile building has minimal intrusion on the field. Numerous roof angles represent the war’s conflict, and the footprint follows actual lines of the battle. The Battle of Resaca occurred May 13-15, 1864 and represents the first significant confrontation in Major General William T. Sherman’s Atlanta Campaign. Resaca was the only battle during this campaign where the full might of both armies faced each other in open battle. Here, Sherman hoped to destroy the Confederate Army of Tennessee led by General Joseph E. Johnston — yet there was no clear winner. When it was over, more than 5,500 men lost their lives, and many believe this was a low estimate. The three days of fighting produced nearly 10 percent of the combined casualties sustained during the Atlanta campaign. Slaves' History Buried in Asphalt, Maria Glod, Washington Post, October 27, 2008. Barely audible over the whirr of traffic, Duron Chavis offered a prayer as he poured water into the earth at the edge of a parking lot between a train trestle and Interstate 95. "We are here to honor our ancestors," Chavis told a group that encircled him one moonlit night this month. "Unfortunately, African Americans have been separated from our blood. We're disconnected from our languages, disconnected from our culture." For the almost two dozen people gathered here, this nondescript slice of pavement represents a long-hidden heritage. Beneath the blacktop are the graves of slaves and free blacks from the 18th and 19th centuries. The city gallows once stood nearby, where a slave named Gabriel was hanged for planning a revolt. Everyone agrees that the cemetery will be commemorated. But exactly how to do that has led to debate in a city that was once the capital of the Confederacy and still struggles with those ghosts. The state's largest school, Virginia Commonwealth University, bought the parking lot this year and has agreed to carve out a piece of it for a public memorial. But a prominent anthropologist at the College of William & Mary, along with many residents, contends that the graves probably extend beyond the strip that the university is donating. They are leading a movement to identify and reclaim the entire site. "We want all of it," said Dieyah Rasheed, who lives in nearby Henrico County. "It is sacred to me as a black woman. My ancestors were buried there. They were the ones who built Richmond. They were the nurses. They were the maids. They were the field croppers. They deserve some honor and respect." The 250-year-old cemetery, used until about 1816, faded from public memory as the city grew up around it. But several years ago, a local historian stumbled on records of its existence. Gabriel was executed there after a failed 1800 rebellion, and some historians believe he could be buried there. Last year, Gov. 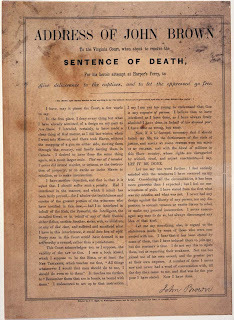 Timothy M. Kaine (D) symbolically pardoned Gabriel and said his "quest for freedom was part of a great American legacy." In recent years, the city has made efforts to commemorate the trials and contributions of slaves. The Richmond Slave Trail Commission has created a walking tour from the James River port where slaves arrived, to a slave jail that is being excavated. The trail also includes a slavery reconciliation statue that was unveiled last year. Still, some African Americans note the proliferation of memorials here to the Confederate past. Monument Avenue honors Confederate leaders such as Robert E. Lee, Thomas J. "Stonewall" Jackson and J.E.B. Stuart. One exception is a statue of black tennis great Arthur Ashe. The drive to preserve the cemetery gained momentum after VCU bought the three-acre downtown lot for $3 million in February. A few months later, as the university took steps to repave the lot and improve its lighting, a small grass-roots protest raised questions about the project's impact on a place of historical interest. Work was halted to allow the state to delve into the land's history. In June, the Virginia Department of Historic Resources concluded that much of the old cemetery and the site of the gallows lay under the interstate and that old records don't define the burial ground's limits. It's unclear how large the cemetery was. But some graves are believed to extend past the highway and into the parking lot, under 10 to 15 feet of fill. The department, drawing on the work of a local historian, also considered the possibility that the graveyard's edges could be defined by a label on an 1810 map that notes "Burial Ground for Negroes." VCU, citing that interpretation, has agreed to turn over a 50- by 200-foot piece of the lot, worth about $350,000, to the city for a memorial. But last month, Michael L. Blakey, director of William and Mary's Institute for Historical Biology, said there was no reason to assume the mapmaker's label encompassed the entire cemetery. Blakey called the estimation of the boundary "implausibly small." He estimated that there could be graves under most, even all, of the parking lot, and recommended digging archaeological trenches, which would not disturb the remains, to determine the cemetery's scope. "If it is important to the community," Blakey said, "there is a way to know the truth about the extent of the burials." VCU officials said they recognize the site's historical and spiritual importance, and that is why they are ceding land for a memorial. But the only practical option is to use the remainder of the lot for student and staff parking because the university is relying on parking fees to pay for the purchase, said Don Gehring, VCU's vice president for government relations and health policy. "We have reached a consensus that this is the most reasonable way to memorialize the site and recognize its significance and at the same time go forward with our purpose for parking," Gehring said. He said VCU would sell the property -- for the $3 million it is paying -- to anyone who wants to preserve the entire site. Kathleen Kilpatrick, director of the historic resources department, said her staff reviewed available records and research to study the cemetery. "Nothing short of archaeology will determine the actual boundaries," she said. "But I don't want to lose sight of the larger goal, which is how best to memorialize the site. The issue is where we go from here to get it right, to honor the people there and to educate the public." She said the department has agreed to work with the Slave Trail Commission to raise money to buy the land. To some in the community, ownership of the land is a much deeper question than who holds the deed. "That land does not belong to Virginia Commonwealth University. It belongs to the black community of this city and this country," Phil Wilayto, a member of the Defenders for Freedom, Justice & Equality, a community group pushing for preservation, said this month at a community meeting. "If this was George Washington's mother buried here, it wouldn't be a parking lot. It would be a nice grassy area," said Chavis, of Richmond. "Though we have moved forward, with Obama running for president, there are still these issues that are with us." Richmond's is not the first such cemetery to be rediscovered. Freedmen's Cemetery in Alexandria, which opened in 1864 to bury former slaves, was forgotten for years but is now commemorated with a park. At the African Burial Ground in Lower Manhattan, uncovered in the early 1990s in a construction project, more than 400 skeletons were examined and then reburied at a site that has become a memorial. Blakey, who was scientific director of the excavation and preservation for the New York burial ground, said the decision to excavate and study the Richmond remains should be the community's. Much of the recorded history of slaves was written by owners who considered them property, not people. But the New York graves, Blakey said, offered a glimpse of humanity. "A story is written in things that were placed in the ground," Blakey said. "There is real reverence. Small things matter: the choice that was made to leave a silver earbob in a child's coffin rather than to keep it and use it for the living. That small act has great meaning." 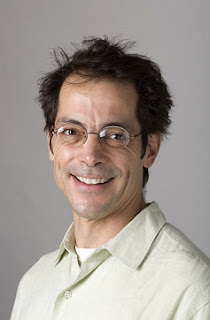 Doug Egerton, a Le Moyne College history professor and author of a book about Gabriel, said the slave was 24 when he plotted to win freedom for slaves by seizing the capital and taking Governor James Monroe hostage. A furious storm disrupted his plan and the plot was uncovered. Gabriel stood more than six feet, unusually tall for the time, Egerton said, and his remains could be under the lot. "I think in many ways finding the bodies, learning what we can and placing them back with some kind of dignity and honor would be a real signal that Richmond can come together," Egerton said. He noted that there is a statue of George Washington not far from the graveyard. "There's no reason we can't honor Washington on his pedestal, and a mile away honor these people who also fought for freedom." 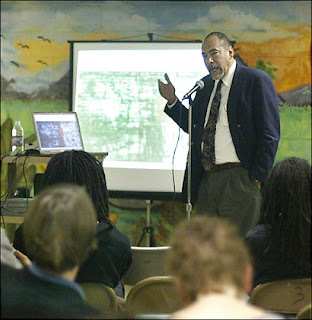 Photo: Michael L. Blakey, a College of William & Mary professor, discusses the site of the burial ground at a community meeting this month in Richmond. Photo by Lisa Billings For The Washington Post. CWL asks, "Who owned the cemetery in 1810?" and can the chain of ownership be documented to 2008? Also, can't a parking lot at a downtown institution of higher education, where parking with limited/controlled access is nearly non-existent, be viewed as equal access to education for descendants of slaves who are enrolled students? The Tipsy Historian responded to my review of Ethan Rafuse's Robert E. Lee book with a referral to a new Joseph T. Glatthaar article Everymans War: A Rich and Poor Man's Fight in Lee's Army in the September issue of Civil War History published quarterly by Kent State (Ohio). Scanning the online contents of last three issues of Civil War History I found an essay by Ethan Rafuse entitled "Poor Burn?" The Antietam Conspiracy That Wasn't in the spring 2008 issue. 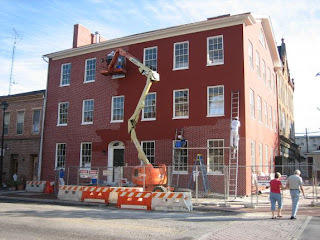 While at the Tipsy Historian's weblog I found The Gettysburg Daily, a weblog with lots of current photographs and news including this interactive map (left) and an update on the Wills House (below). One of The Bedford Series in History and Culture series, Defending Slavery places the words of Southerners in the hands of the reader. Beginning a small portion of Thomas Jefferson's Notes on the State of Virginia(1787)and concluding with Josiah Nott's Instincts of Races (1866), this book displays the knowledge and opinions that Southerner's held regarding slavery and blacks. In a forty-four page introduction, Paul Finkelman outlines the legitimacy of slavery in the classical world, colonial America, Revolutionary America, and the early national period. He makes the case that the first defenses of slavery that were based upon races appeared after the American Revolution and were an attempt to reconcile the Declaration of Independence with the fact of perpetual forced labor. 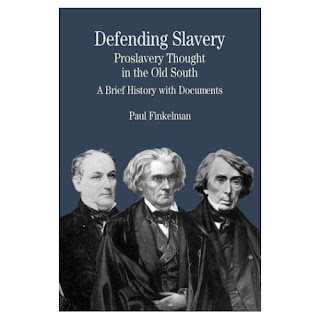 Outlining antebellum proslavery thought, Finkelman sets forth the racial theories and ideologies promoted by Southerners. Primary documents reveal the historical and classical defenses of slavery and the religious, economic, legal, political and racial defenses of slavery. The economic, legal, political rationales are provided by famous men in Southern and Confederate history. In an 1837 senate speech John C. Calhoun argues that slavery is indispensable for the peace and happiness of both whites and blacks. Edmund Ruffin argues that slavery treats blacks better than the North treats wage laborers. Thomas R. Cobb states that slavery is essential for blacks because there are no examples of blacks achieving prosperity outside of forced servitude. James Henry Hammond understands that wage labor and slavery are necessary for a prosperous culture which needs a mudsill people to perform onerous tasks. Confederate vice president Alexander Stephens declares in 1861 that slavery is the cornerstone of the Confederate nation and culture. Ministers reflect upon the duties of Christian masters, the Bible's presentations of slavery, slave marriages and divine revelation. Judges and courts weigh in on the definitions of slavery and its foundation in natural law. Diseases particular to blacks, physical peculiarities of Negroes, and the instincts of the races are forcefully and bluntly states by Southern doctors and naturalists. Finkelman's introductory essay and his selection of documents are approachable for the student, the layman and the specialist. With a clear and concise narrative style and a precise use of vocabulary, Finkleman develops both the context and the content of the Southern frame of reference for the institution of slavery. 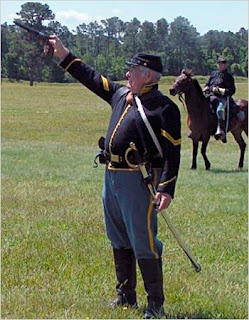 Five Best: James M. McPherson On Books About The Civil War Away From The Battlefield, Wall Street Journal, October 18-19, 2008. 1. 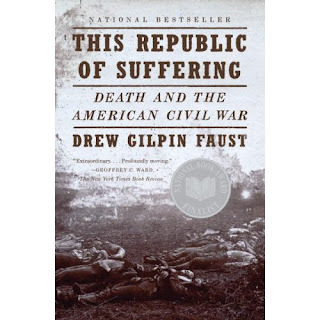 This Republic of Suffering, Drew Gilpin Faust, Knopf, 2008. No other generation of Americans encountered death on the scale of the Civil War generation. The 620,000 soldiers who died were 2% of the American population at that time; an equivalent death rate in a war fought today would leave six million Americans dead. How did people in both the North and South cope with this devastating toll? How did they mourn the dead, honor their sacrifice, commemorate their memory and help their families? Drew Gilpin Faust, the president of Harvard University, offers powerful and moving answers to these questions. During and after the war, the U.S. government created 72 national cemeteries for the reinterment of Union war dead with dignity and honor; many veterans of the nation's armed forces continue to find their final resting places in these cemeteries today. 2. 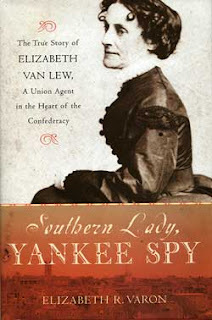 Southern Lady, Yankee Spy , Elizabeth R. Varon, Oxford University, 2003. Popular Civil War literature is filled with romantic and sensational stories of female spies, many of them made of whole cloth. But this story of Elizabeth Van Lew is eminently true. A member of a prominent Richmond family, she inherited her mother's antislavery convictions. She freed her own slaves before the war and purchased some of their relatives to free them. During the war Van Lew skillfully traded on her reputation for eccentricity (she was called "Crazy Bet") to get away with hiding escaped Union prisoners of war and providing Gen. Ulysses S. Grant with vital intelligence smuggled through the lines during the 1864-65 siege of Richmond. 3. Civil Wars , George C. Rable, University of Illinois, 1989. Southern white women experienced the Civil War more directly and disastrously than any other group of civilians. In "Civil Wars," George C. Rable describes the hardships, caused by shortages of everything in the wartime South, endured by slave women as well as by white women. But slaves did win their freedom in the conflict, while white women -- of slaveholding and nonslaveholding classes alike -- lost almost everything. At least 75,000 of them were widowed by the war, their children left fatherless. Enthusiastic about the cause of Confederate independence early in the conflict, many of these women turned against the war amid mounting disease, malnutrition and economic destruction. Yet, ironically, Southern white women became the main custodians of the postwar Lost Cause romanticization of the Confederacy. 4. The Imagined Civil War, Alice Fahs, University of North Carolina, 2001. In this sparkling study, Alice Fahs rescues from undeserved obscurity the vast outpouring of popular literature produced during the Civil War. Far from being the "unwritten war" described by literary historians, the conflict produced fiction, nonfiction and poetry that interpreted a people's war to the people. "Only weeks after the start of war in 1861," Fahs writes, "illustrated weeklies such as Frank Leslie's Illustrated Newspaper began publishing columns labeled 'war humor,' 'war romance,' and 'thrilling incidents of the war.' " The most intriguing aspect of "The Imagined Civil War" is its discussion of magazine stories and books written for children, which not only shaped their perceptions of the earth-shaking events of their youth but also influenced their worldview as adults during the postwar era. 5. Team of Rivals , Doris Kearns Goodwin, Simon & Schuster, 2005. 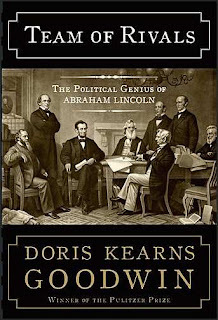 The "rivals" in this gripping narrative of politics in Washington during the war are the four men who competed for the presidential nomination of the Republican Party in 1860: William H. Seward, the presumptive favorite; Salmon P. Chase, the most radical opponent of slavery in this antislavery party; Edward Bates, the most conservative; and Abraham Lincoln, who until his debates with Stephen Douglas in 1858 was the most obscure of the four. But because he could unite the party's factions, Lincoln won the nomination -- and the election. Fearing that Republican ascendancy spelled the ultimate doom of slavery, most slave states seceded and provoked war. Meanwhile Lincoln took the unprecedented step of appointing his rivals to key cabinet positions. The men differed on how to conduct the war, and several clashed personally, yet Lincoln forged them into an effective team that pulled together in the crisis. Mr. McPherson is the author of the Pulitzer Prize-winning Battle Cry of Freedom (1988). His latest book, Tried by War: Lincoln as Commander in Chief, has just been published by The Penguin Press. Text Source: Wall Street Journal, October 18-19, 2008. CWL: Can't complain; they're all on my bookshelf too. 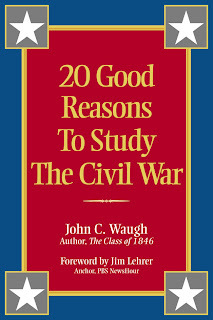 20 Good Reasons To Study The Civil War, John C. Waugh, 96 pages, McWhiney Foundation Press, 2004, $12,95. In 20 chapters each three to five pages long, John C. Waugh provides a clear and succinct summary of the legacy of the American Civil War. Here is the list in CWL's words. The American Civil War . . .
created an industrial nation. The implications Lincoln's phrase 'entirely free or entirely slave' implies wage paid and unpaid labor. The productivity of wage labor in an early industrial society was unknown in 1861 but by 1865 the productivity of wage labor was to become an American virtue. created fabulous fortunes for individuals. Andrew Carnegie, J.D. Rockefeller, and J.P. Morgan were not Union army veterans though they were in their 20s when the war began. The war was a management learning lab for these three young men. Iron and railroads, finance and railroads, petroleum and railroads were the fields of capital management exploration. created political oddities. four presidential candidates in 1860, politicians demanding to be generals, a presidential election during wartime for a second term and the last two term president was Andrew Jackson 1828-1836, Lincoln's second term opponent was a general who hated politicians, first time voters in 1864 voted while on campaign. pioneered a new print media. the telegraph, the Associated Press, the new presses. inspired great literature. not just novels like Killer Angels, The Red Badge of Courage, Cold Mountain, and The Black Flower but the immense amount of personal diaries and correspondence like Frank Haskell's Gettysburg letter and Grant's memoirs. still speaks today. though letters, diaries and through Ken Burns' The Civil War, though the literary imaginations of Jeff Shaara and Howard Bahr, through the painters' hands Don Troiani and Keith Rocco, and the diligence of the National Park Service. The generalship of Robert E. Lee, the Confederacy's greatest commander, has long fascinated students of the American Civil War. In assessing Lee and his military career, historians have faced the great challenge of explaining how a man who achieved extraordinary battlefield success in 1862-63 ended up surrendering his army and accepting the defeat of his cause in 1865. How, in just under two years, could Lee, the Army of Northern Virginia, and the Confederacy have gone from soaring triumph at Chancellorsville to total defeat at Appomattox Court House? 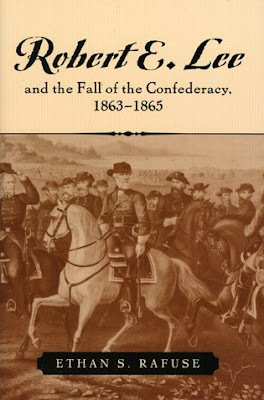 In this reexamination of the last two years of Lee's storied military career, Ethan S. Rafuse offers a clear, informative, and insightful account of Lee's ultimately unsuccessful struggle to defend the Confederacy against a relentless and determined foe. Robert E. Lee and the Fall of the Confederacy describes the great campaigns that shaped the course of this crucial period in American history, the challenges Lee faced in each battle, and the dramatic events that determined the war's outcome. 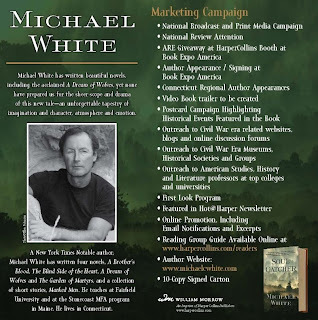 In addition to providing readable and richly detailed narratives of such campaigns as Gettysburg, Bristoe Station, Spotsylvania, and Appomattox, Rafuse offers compelling analysis of Lee's performance as a commander and of the strategic and operational contexts that influenced the course of the war. He superbly describes and explains the factors that shaped Union and Confederate strategy, how both sides approached the war in Virginia from an operational standpoint, differences in the two sides' respective military capabilities, and how these forces shaped the course and outcome of events on the battlefield. Rich in insights and analysis, this book provides a full, balanced, and cogent account of how even the best efforts of one of history's great commanders could not prevent the total defeat of his army and its cause. It will appeal to anyone with an interest in the career of Robert E. Lee and the military history of the Civil War. 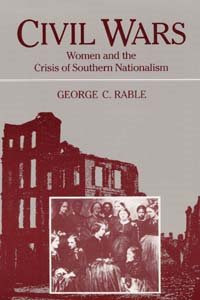 CWL: Rafuse states the purpose of this book is "to explain how Lee and the Confederate cause went from . . . [the] triumph of Chancellorsville to complete defeat in 1865." Did Lee's aggressive strategy and tactics destroy his army? Or was it the course of nature when the Army of Northern Virginia was out manned and outgunned? Or was the best regimental, brigade, division and corps leaders dead by 1863 and few quality replacements available? Did Jefferson Davis play a major role by ignoring logistical problems that brought about the demise of General Lee's army? Rafuse also states that "this study will not only consider matters on the Confederate side, but will also devote considerable attention to decisions and actions taken by Lee's counterparts on the Union side." As George Pickett said regarding the outcome of the Grand Assault at Gettysburg, "I believe the Union army had something to do with it." Rafuse confesses that the working title of the book was Robert E. Lee and The Triumph of the Union. He was convinced by friends that the title might be confusing to some readers, and CWL adds might anger others. 2009 appears to be the year of re-examining Lee and his army. Joseph Glathaar's General Lee's Army From Victory to Collapse arrived in May and re-invigorated the topic and moved it forward. CWL will have both Glathaar's and Rafuse's work on the Top Ten of 2009 list. Rafuse has been busy. Before 2009 closes, his Antietam, South Mountain, and Harpers Ferry: A Battlefield Guide should be available December 1. In Robert E. Lee and the Fall of the Confederacy, 1863-1865, Rafuse tips his hat to his 'good friends and colleagues. Steven Woodworth, Brooks Simpson, Carol Reardon, Mark Grimsley and Chris Stowe; also, among his friends and colleagues are John Hennessy, Donald Pfanz, and Chris Calkins of the National Park Service. CWL has read books by each of these, with the exception of Stowe, and appreciates their scholarship and fine narrative voices. With songs from a troubadour, flags fluttering in the breeze and smiles for “a fine day,” officials, guests and Vicksburg National Military Park staffers celebrated the official dedication of the Connecticut state monument Tuesday — newest in the inventory of the 109-year-old park. It is in a noncontiguous section of park land, just west of the river bridges. Many of them sported shamrock stickers in honor of the 9th Regiment Connecticut Volunteers, the “Irish Regiment” that labored in June and July 1862, attempting to dig a canal across DeSoto Point near Delta, La. The monument is near the only visible remnant of the attempt commissioned by Union Gen. U.S. Grant to entice the Mississippi River to bypass Vicksburg. Had the canal succeeded, a battle to conquer Vicksburg would have been less crucial, as Confederate cannon would not have been able to fire on passing Union boats. “This is a fine day for the park to add a state monument to the otherwise grand collection of monuments that we already have,” said Monika Mayr, VNMP superintendent. “It really enhances the site and adds to our ability to tell the story of the canal here.” A six-man Knights of Columbus honorary color guard, decked out in white, green, purple and red, stood at attention — three on one side of the monument, three on the other — during the ceremony. The first Supreme Knight, James T. Mullen, was a sergeant in Company C of the 9th Regiment at Vicksburg. The black and green granite monument stands about 10 feet high and 10 feet long, and consists of a base, two side panels, the etched centerpiece and two benches. The pieces weigh 13,597 pounds. In his remarks, VNMP historian Terrence Winschel thanked Larkin for his vision and persistence in spearheading the effort to see the memorial realized. “Looking back on it, it has been a remarkable achievement,” Winschel said. Carol Brown, of Branford, Conn., made the trip to honor two of her ancestors, both of whom survived the canal effort and are memorialized with portraits on the monument — her great-grandfather, Lt. William O’Keefe and Capt. Lawrence O’Brien, whose sister married O’Keefe after the war. Brown was there with her two daughters, Alison Brown and Kristin Fary, both of Atlanta, and Fary’s three children, Grace, 15, Paige, 14 and Jack, 6. “We heard lots of stories from our grandmother about her Uncle Larry,” Alison Brown said. “Even in the heat they had to wear their full woolen uniforms. They had to march in dress parade, wearing their packs and carrying their arms at the end of the day. They weren’t even allowed to bury the men after they collapsed and died.” Winschel remarked after the ceremony that the monument can only add to the park’s reputation as the “art park of the world,” a moniker given to it by a Civil War veteran. “It adds to the significance of the site,” he said, nodding toward what remains of the canal nearby. The Irish Regiment, 845-men strong when mustered-in in New Haven, Conn. in the fall of 1861, saw action in Pass Christian and occupied New Orleans before venturing up the river to Vicksburg in June 1862. 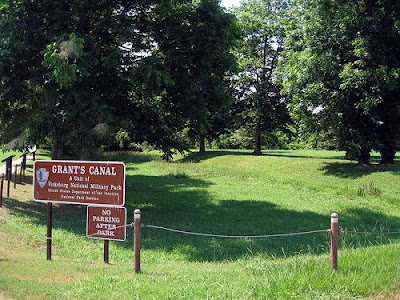 Though the site memorializing their efforts is called Grant’s Canal, the work of the ninth was known as Williams Canal, as Union Gen. Thomas Williams commanded the effort. The canal across the neck of a peninsula was to be long and deep enough to accommodate Union boats, Winschel said. In the high heat and humidity, “with only the muddy water of the Mississippi to drink,” 153 men of the 9th died in the effort, from heat stroke, malaria, dysentery and other diseases — “ a ghastly toll in human life,” Winschel said. In 1863, Union forces moved down the west side of the Mississippi, crossed the river at Bruinsburg and then moved up through Port Gibson, Raymond and Jackson before turning back toward the river. After direct assaults failed, a siege began and Vicksburg was surrendered on July 4. The park, created by Congress in 1899, preserves much of the terrain and battlements from the war on the city’s perimeter. In addition to the noncontiguous site in Louisiana, the National Park Service also owns two overlooks on Washington Street and the headquarters of Confederate commander Gen. John Pemberton on Crawford Street. 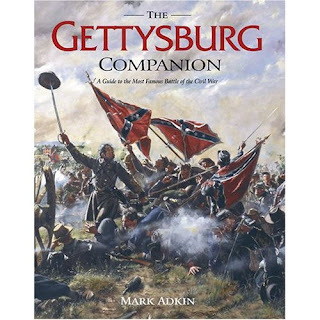 The Gettysburg Companion: A Guide to the Most Famous Battle of the Civil War, Mark Adkin, 544 pages, Stackpole Books, $69.95. Scott Hartwig, supervisory historian of Gettysburg National Military Park, states on the front inside flap of the cover, that "This is the Gettysburg book that students and aficionados of the battle have dreamed about . . . . The Gettysburg Campanion is quite absolute gem." So it appears but CWL sees that many of the books strengths are also its weaknesses. Open the book at page 429: There is a nice modern color photograph taken six feet above the ground of the terrain over which 'Kershaw's Brigade Attacks From the Millerstown Road'. The Millerstown Road is on the horizon not the foreground or so it appears from the title of the photograph. On the photograph are the key sites: Rose Farm and Biesecker's Woods in the distance; three orange arrows flow from the horizon and over the ground showing the path of Confederate troops towards the photographer. The photograph looks sharp and the graphics are crisp. The problem is that the author does not show on a map the position on the battlefield where the photographer stood. Though in the caption a description is given regarding the the photographer's position as being from the position of Bigelow's battery. If that is the case and it does appear so, then the title of the photograph is wrong. Kemper does not attack from the Millerstown (Wheatfield) Road but towards the Millerstown Road. Now turn to panorama photographs on page 434 and 435. 'The View from Bigelow's Final Battery Position Looking Toward the Rebel Attack'. In this case the title matches the position of the photographer and the movement of the Confederate troops. CWL sees that Akins should have asked Stackpole Publishing for a few sharp-eyed, licensed battlefield guides to actually read everything in the book. Adkin has invested a major effort into The Gettysburg Companion but he leaves CWL grasping in vain for explicit guideposts for the sources he consulted. CWL also has complaints that the citations are inadequate for convenient source checking. The bibliography of consulted sources is too small to substantiate the immense amount of material the author discusses. This leads CWL to consider the charges which J.D. Petruzzi levels in his Amazon.com review and his remarks on online The Gettysburg Discussion Group forum against Gettysburg Companion; specific quotations were used from diary and letter sources that can be found only in others scholarship. Also, Petruzzi states that the William Frassinito, acknowledged as the expert on Gettysburg photography, quickly found misidentified illustrations. It appears that Adkin is a subscriber to both North and South Magazine and Gettysburg Magazine. In the acknowledgments, Adkin thanks Tom Desjardins and the Friends of the National Parks at Gettysburg for allowing him to use their map as a base from which he adds enhancements. Yet it appears that some information is taken from North and South Magazine and Gettysburg Magazine without attribution. As enjoyable as The Gettysburg Companion can be, CWL winces at the lapse of acknowledgement by Adkin of the many, many historians who have mined primary sources and published their work with bibliographic citations. If Gettysburg Companion is intended to be a coffee table book which looks nice on display and a satisfying book through which to browse, then the meager citations are not an issue. But if Adkin hoped his work would stand alongside the work of scholars, then the Gettysburg Companion will not be on the bookshelf but stay on the coffee table. Abraham Lincoln began his presidency admitting that he knew "little about ships," but he quickly came to preside over the largest national armada to that time, not eclipsed until World War I. Written by prize-winning historian Craig L. Symonds, Lincoln and His Admirals unveils an aspect of Lincoln's presidency unexamined by historians until now, revealing how he managed the men who ran the naval side of the Civil War, and how the activities of the Union Navy ultimately affected the course of history. The first book to focus on Lincoln's management of the U.S. Navy, and an unforgettable portrait of a commander-in-chief at war. Abraham Lincoln began his presidency admitting that he knew "little about ships," but he quickly came to preside over the largest national armada to that time, not eclipsed until World War I. 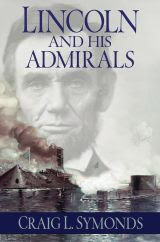 Written by prize-winning historian Craig L. Symonds, Lincoln and His Admirals unveils an aspect of Lincoln's presidency unexamined by historians until now, revealing how he managed the men who ran the naval side of the Civil War, and how the activities of the Union Navy ultimately affected the course of history. Beginning with a gripping account of the attempt to re-supply Fort Sumter--a comedy of errors that shows all too clearly the fledgling president's inexperience--Symonds traces Lincoln's steady growth as a wartime commander-in-chief. Absent a Secretary of Defense, he would eventually become de facto commander of joint operations along the coast and on the rivers. That involved dealing with the men who ran the Navy: the loyal but often cranky Navy Secretary Gideon Welles, the quiet and reliable David G. Farragut, the flamboyant and unpredictable Charles Wilkes, the ambitious ordnance expert John Dahlgren, the well-connected Samuel Phillips Lee, and the self-promoting and gregarious David Dixon Porter. 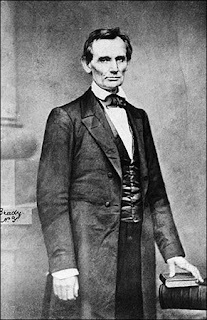 Lincoln was remarkably patient; he often postponed critical decisions until the momentum of events made the consequences of those decisions evident. But Symonds also shows that Lincoln could act decisively. Disappointed by the lethargy of his senior naval officers on the scene, he stepped in and personally directed an amphibious assault on the Virginia coast, a successful operation that led to the capture of Norfolk. The man who knew "little about ships" had transformed himself into one of the greatest naval strategists of his age. A unique and riveting portrait of Lincoln and the admirals under his command, this book offers an illuminating account of Lincoln and the nation at war. In the bicentennial year of Lincoln's birth, it offers a memorable portrait of a side of his presidency often overlooked by historians. 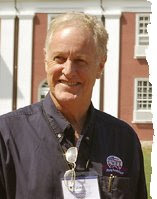 Craig L. Symonds is Professor Emeritus at the U.S. Naval Academy and the author of ten previous books, including Decision at Sea: Five Naval Battles that Shaped American History, which won the Theodore and Franklin D. Roosevelt Prize in 2006. Soul Catcher, Michael White, William Morrow Publishing, 432 pp., hardcover $24.95, paperback $14.95, Unabridged audio compact disks $34.95. Soul Catcher is not a sweeping novel of the antebellum period. It is cursory and somewhat predictable saga a man and woman, one a slave catcher and the other a slave. Augustus Cain, gambler, wounded Mexican-American War veteran and lapsed fugitive slave catcher accepts an assignment from Mr. Eberly, a wealthy Virginia plantation owner. The deal is that Eberly will forgive Cain's gambling debt and toss in cash if Cain tracks down two runaway slaves, Henry and Rosetta. The year is 1858 and of course one of the slaves has escaped to John Browns' upper New York state farm. With three very stereotypical tracking companions assigned to him by Eberly, Cain sets out on a trek from Richmond to New York's Adirondack Mountains and to Boston. After Cain captures the runaways and turns south, the female slave and he fall in love during the course of the hazardous trip. Also during the return trip stereotypes such as a medicine show doctor with a hunchback, a dying widow with a dead husband in her bed, a cholera victim with a dead baby, are encountered. At times, in a cocaine/opium haze Cain hallucinates wolves and examines his memories of a failed matrimonial engagement, a failed love affair with a poor Mexican-Indian woman, and the failed relationship with his father. John Brown himself appears several times to clarify what is at stake in Cain's life and chosen profession. At times the relationship between Rosetta, the slave and Cain rings true and at other times it is over-the-top melodrama. The climax and the epilogue seem forced; certain episodes in the novel come across as overtly manipulated by the author. None of the characters are independent of the author and only Cain is a full drawn and half-way interesting character. His hearing at times is very sharp as bad guys sneak up on him; at other times he is stone deaf. During the final shoot out at night in a cabin on the south shore of the Ohio River, Cain begins to run out of bullets. As Cain sweats through this predicament, this reader yelled at him, "Hey Cain! There are five dead men in the room each with bullets left in their guns! Get the repeating rifle first!" He didn't hear me. As he is looking down the barrel of the gun of the last man, Eberly, standing, Rosetta returns and shoots her master dead after Cain tells her for the first time that he loves her. There are times when the antebellum details alone admiralably carries the narrative. But Soul Catcher does not immerse itself or the reader in the spirit of the antebellum era though there are several wonderful scenes that ring true to the times. Overall, much of the novel is 'tell' with very little 'show.' Even political correctness raises its head as Cain ponders whether all white men are guilty of the sin of slavery. He refuses to marry Rosetta because as a couple he believes that they won't fit in anywhere. During this era, every large city had its neighborhood where poor Irish and poor free blacks mixed and married. In NYC it was Five Points; in Pittsburgh it was Little Haiti. Widely travelled Cain doesn't know this though. Amazingly, in the epilogue Cain is in the Confederate army the night before the battle of Antietam. He believes that the war not about slavery. Really, not about slavery but a Southern pride thing which you really wouldn't understand. Secret Artist Of Great War Is Unmasked In New Book, Jerome Taylor, The Independent, October 8, 2008. A British artist who risked his life to draw intricate sketches of enemy front lines during the First World War was finally unmasked yesterday more than 30 years after his death. 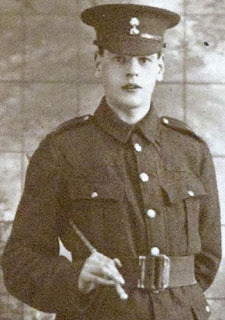 Len Smith, a sapper and espionage expert with the Royal Engineers Special Branch, would hide in no man's land for days on end, sketching enemy positions with remarkable accuracy. Now a book of Sapper Smith's drawings has been released to the public. Armed with little more than a set of coloured pencils Mr Smith, who was from Essex, returned to no man's land day after day to create drawings of German troop positions. In one of the most astonishing feats of counter-espionage Mr. Smith crawled within metres of an enemy HQ and drew a battle-scarred tree so accurately that on his return to the trenches British Army chiefs were able to recreate a perfect, hollow steel replica. Without the Germans knowing, sappers replaced the real tree with the replica one in the dead of night. Tunnels were soon dug towards the steel hull, enabling soldiers to listen in on German positions night after night undetected. Many of the sketches displayed in the book, The Pictures and Diary of a Wartime Artist, show detailed drawings of the Vimy Ridge, a five-mile-long escarpment to the north-east of Arras where Canadian and British forces became bogged down in trench warfare. Despite his bravery Mr. Smith, who died in 1974, was never decorated. His great-nephew, Dave Mason, compiled the book using excerpts from Mr Smith's diaries. Mr Mason, 62, of Woodford Green, Essex, said: "I was amazed when I read the diary to find out how much he had been involved in the Great War. He talks of his friends and how most of them were killed, of the narrow escapes he had. Len, like most of his generation, was a humble man who did not boast or revel in what he had been through during the war. He always said, 'I would rather have a WC than a VC'." "It’s often said that biographies reveal as much about their biographers as their subject. I plead guilty, for I was born in Lincoln (Nebraska) and fell in love with the Civil War era at age fourteen, which is when I began reading Lincoln and Douglass. Moving was the central experience of my formative years, and literature and history offered alternative realities that could redeem the constant dislocations and confusions of my adolescence in the late 1970s. I hungered for characters I could identify with; and those from the Civil War era seemed larger than life, more heroic, able to give meaning and purpose to my present. I was especially drawn to Douglass. I loved the way he wrote, I yearned to have something of his undaunted courage, and, strange as it may seem now, I wanted to be like him. After all, here was a slave—a total outsider—who stood up to the meanness around him at the risk of losing his life, and who found in books a way to “give tongue to his thoughts,” as he put it. A few years later, I realized that Lincoln too, had been an outsider, escaping the fighting and drinking of his backwoods communities through literature. They learned how to use words as weapons, and I desperately wanted a dependable weapon. Years later, while in graduate school, I realized just how significant Douglass’s and Lincoln’s rise really was; they are the two preeminent self-made men in American history. (Other contenders like Ben Franklin began life with more comfort and status.) At the time, I was researching abolitionists, and had fallen in love with the wide array of wonderfully weird men and women, from blacks and whites to rich and poor, their wild utopian visions, and their extraordinary journeys through life. I wanted to know how they were able to remake themselves, what the costs of doing so were, and how self-transformation related to race and reform. I addressed these themes in my first book, The Black Hearts of Men, and while writing it, discovered that Douglass and Lincoln ultimately became friends, despite the social and political gulfs separating them. I wanted to know how and why Douglass and Lincoln were able to come together as they did; and I decided to write about their self-making. Their friendship, I realized, depended in part on their having continually remade themselves. In the past fifty years, scholars have largely disparaged the concept of self-making. They saw it as a term for Madison Avenue, not the Ivory Tower; it had the ring of an advertisement, not scholarship. Yet the concept of self-making, its rewards and costs, is central to the American experience, for it functions as a barometer of the ideals of freedom and equality of opportunity. I also felt that scholars had not adequately accounted for the significance of self-making in the personalities, politics, and decisions of Douglass and Lincoln. Too often, these men are written about as though they were born brilliant, a cut above other mortals. Too often, Lincoln has been characterized as America’s Christ, the redeemer president. The result is a static, romantic, mythic figure rather than a man born dirt poor living, striving, grappling in a distant past. 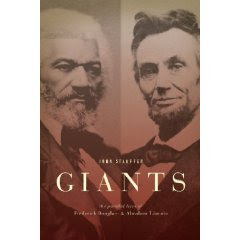 Giants began in 2005 as an essay on Douglass and Lincoln in the July 4th issue of Time Magazine. Initially, I planned to include the essay as part of a book on interracial friendship, but their story, I realized, was bigger than an essay or chapter. Giants was written at a propitious time. Not only is Lincoln’s bicentennial in 2009, which kept me on or near deadline; but Barack Obama’s The Audacity of Hope had become a bestseller and then of course Obama decided to run for president. Obama’s journey, like Douglass’s and Lincoln’s, has been nothing short of breathtaking. Perhaps it is not coincidental that he knows Douglass and Lincoln better than many scholars, has steeped himself in their writings, and has been inspired by them. While many journalists have noted the influence of Lincoln on Obama, none has shown how Douglass shaped his understanding of himself and his country. 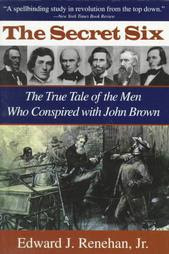 CWL---John Stauffer's Meteor of War on John Brown and his Black Hearts Of Abolitionists on Brown's and other abolitionists' identification with slaves are both remarkable books in their freshness of perspective that rings true; the works set the militant and pacifist abolitionists within the climate of their times. Stauffer's books as well as David Reynolds' John Brown, Abolitionist depict John Brown, as someone who has has rationally placed his being into the hands of a perfectly loving, perfectly just God who hates the type of slavery that fractures families and human dignity. Brown, who is often seen as a madman or an incompetent, is revealed as more fully human and humane than most social critics of the era. Yet, his violence had an unforntuate place in the 19th century world, similar to the caning of Charles Sumner of Massachusetts by Preston Brooks of South Carolina on the floor of the U.S. Senate and the sacking of Lawrence, Kansas by border ruffians. Poets, Actors Celebrate Lincoln's Poetic Side, Susan Logue, Voice of America Broadcasting, October 6, 2008. The February 12 bicentennial of Abraham Lincoln's birth is about four months away. Events have already begun taking place across the United States to honor the 16th president, who led the nation during its bloody, four-year civil war [1861-1865]. One of the most recent, sponsored by the National Endowment for the Arts, celebrated Lincoln's poetic side last month [Sept 22] in Washington. VOA's Susan Logue was in the audience for Rise Up and Hear, an evening of readings by some of America's leading poets and actors. Not all of the readings were strictly poetry. Academy Award-nominee Joan Allen had the honor of reading a speech that Lincoln delivered in November 1863 at the site of the bloodiest battle of the U.S. civil war. The Gettysburg Address has been memorized by generations of American schoolchildren. "It's such an important historical speech, one of Lincoln's most important and most remembered, so I was hoping I'd get a chance to do it," Allen told me before the event. "It's written in prose and this is an evening of poetry, but it really is poetic prose." National Endowment for the Arts Chairman Dana Gioia, who hosted the evening of poetry readings, says, "of all the American presidents, [Lincoln] is the one whose language is most poetic and resonant." "Everybody notices the cadences and rhythms and the way the consonants and vowels make something similar to music," notes former U.S. poet laureate Robert Pinsky. Lincoln did write poems as well. Pinsky read one at the evening's event that was written by Lincoln in 1846, 15 years before he became president, titled "My Childhood Home I See Again." Pinsky says Lincoln was not a great poet, but he was a "competent one." He does, however, believe Lincoln was a great writer and credits a love of poetry for that skill. "Every great prose writer that I can think of loved poetry - wrote it and read it." NEA Chairman Dana Gioia, a poet himself, says Lincoln's love for poetry was something widely shared by Americans in the mid-19th century. "Americans were very much in love with poetry and it was a public medium in a way that it really isn't any more." It was natural, Gioia says, for poets to respond when Lincoln was assassinated on April 14, 1865, just days after the American civil war ended. Walt Whitman, considered among the most influential of American poets, wrote many poems about Lincoln. "When Lilacs Last in the Dooryard Bloom'd" was his favorite. 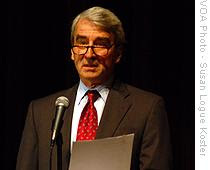 Academy Award-nominee Sam Waterston read the poem for the Washington audience. He is best known today for his portrayal of Jack McCoy in the dramatic TV series "Law and Order." 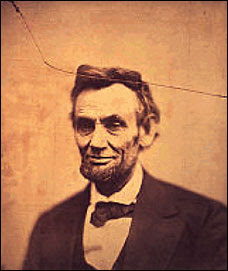 But Waterston has often portrayed Lincoln. "He is such a fascinating figure," Waterston says, "such a great mind, such an unbelievably gifted speaker. I really defy anybody to not be drawn in." Many have been drawn in by Lincoln's unique character, says NEA Chairman Dana Gioia, and poets have been no exception, not only those who lived during Lincoln's time, like Whitman, but those of later generations like Carl Sandburg. In addition to poems about Lincoln, Sandburg wrote a six-volume prose biography of the president. The first two volumes, Abraham Lincoln: The Prairie Years, published in 1926, provided Sandburg with his first financial success. The four-volume Abraham Lincoln: The War Years earned him a Pulitzer Prize in 1940. "Sandburg thought of Lincoln as his hero," Gioia says. "He looked to Lincoln as his model of the democratic America that he admired." He wasn't alone. "There is no question as to what American president was most inspirational to poets -- that has been and has always been Abraham Lincoln," Gioia says. "Born in a log cabin in Kentucky, backwoods lawyer who rises to the Presidency of the United States, who leads us during our most destructive war, who frees the slaves and is killed by an assassin's bullet. His life is the very stuff of poetry." Lincoln's life and his legacy will be the subject of several symposia, exhibits and other events that will continue beyond his February 12 birthday, throughout the bicentennial year. 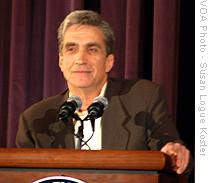 Middle--Former U.S. poet laureate Robert Pinsky says Lincoln was a great writer and competent poet. A Rebel Soldier’s Aim Is Still Pretty Accurate, But His Timing Is Off , Ralph Blumenthal, New York Times, October 4, 2008. Was it the South rising again? Or just a very uncivil blunder on a hallowed Virginia battleground? Either way, Thomas Lord, a Bronx-born Yankee, felt the bite of a rebel bullet in Dixie last weekend, 143 years after the surrender at Appomattox. He was the latest casualty of a national conflict under re-enactment most anytime, anywhere above and below the Mason-Dixon line, although not normally with live ammunition. “I’ve never been shot before,” said Mr. Lord, 73, a former New York police officer and a corporal in the Seventh New York Volunteer Cavalry, or rather, a latter-day and somewhat aged replica of that unit. On Sept. 27, Mr. Long and the rest of the bluecoats were lined up for re-enactment of a nasty piece of trench warfare near Suffolk, Va.
“The rebels were dug in and we had taken their earthworks,” he said. “We had just gotten down to the trench and raised our kepis. We finished saying ‘Hurrah! Hurrah!’ when I was hit with a .44-cal ball.” The marble-size projectile, evidently fired from the Confederate ranks, struck him in the back and passed though his shoulder, forcing a truce while a helicopter was flown to the battlefield to take him to a hospital. The shot just missed a fellow trooper, Jon Hofmeister, a real-life chief petty officer in the Navy, recently back from Iraq. Mr. Long, who moved to Virginia after he retired, returned home from the hospital this week. He said he was bandaged but recovering well, with his doctor, he said, “amazed that I could have the strength and mobility in the wounded limb.” But the psychic wounds may take longer to heal. “Nobody came forward, that’s what’s bothering me,” said John C. Jobe, 66, a retired construction supervisor originally from upstate New York and a sergeant in the mounted unit. Mr. Jobe said the ball, a modern reproduction, came from a pistol “and only three people, on the Confederate side, had pistols.” He said the guns produced “a terrible kick” so the shooter must have known he had fired. All of the Union soldiers’ guns, .54-caliber Sharps carbines, were inspected before the battle to make sure they were empty, as is the iron-clad rule at re-enactments, Mr. Jobe said. “These things happen,” said Kay Jorgensen, editor of Civil War News, a Vermont monthly reporting historical happenings and preservation efforts. In 1998, a re-enactor was shot in the neck at a 135th anniversary event at Gettysburg (medical researchers used the opportunity to compare his treatment with that of veterans wounded in the original carnage). Another re-enactor was shot in the foot in August 2008, also at Gettysburg. No arrests have been made. “We’re still trying to locate certain individuals,” said Sheriff C. W. Phelps of Isle of Wight County. The shooter may not have been one of the official re-enactors, he said, but possibly a “walk-on” more difficult to identify. The re-enactment was performed at the behest of filmmakers shooting a documentary of the battle. But the filmmakers have forced investigators to go to court to compel production of the footage, the sheriff said. According to a casting call sent out by e-mail in August, the film is being made by a company called Alderwerks and is directed by Matt Burchfield, who worked on the 2005 Terrence Malick feature, “The New World.” An e-mail message sent this week to the casting company drew no response. Text Source: New York Times, October 4, 2008. Abolition, sponsored by the Gilder Lehrman Institute of American History. In addition to Smallwood, the other finalists for the prize were Anthony E. Kaye for Joining Places: Slave Neighborhoods in the Old South; Kristin Mann for Slavery and the Birth of an African City: Lagos, 1760-1900; and Chandra Manning for What this Cruel War was Over: Soldiers, Slavery, and the Civil War. The $25,000 annual award is the most generous history prize in the field. The prize will be presented to Smallwood at a dinner in New York City in February 2009. This year's finalists were selected from a field of over seventy five entries by a jury of scholars that included Barrymore Anthony Bogues (Brown University), Christopher Clark (University of Connecticut), and Rebecca J. Scott (University of Michigan School of Law). The winner was selected by a review committee of representatives from the Gilder Lehrman Center for the Study of Slavery, Resistance and Abolition, the Gilder Lehrman Institute of American History, and Yale University. that will lead scholars to rethink their understanding of the 'middle passage,' Africa's diaspora, and the relationships between Africa and the New World, says Clark, the 2008 Douglass Prize Jury Chair and Professor of History at the University of Connecticut. "Stephanie Smallwood uses records of the English Royal African Company's trade with the Gold Coast to provide insights into the lives of the men and women the company bought, transported, and offered for sale in the Americas. 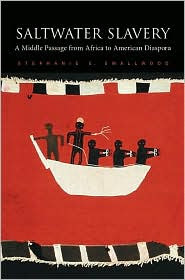 Tracing the steps that led from captivity in Africa to final sale in the New World, Smallwood gets behind the generalities that often characterize studies of the slave trade. She shows how at each stage captives found themselves transformed and re-presented as commodities - for purchase by merchants; for confinement aboard ship; and for resale as plantation workers or servants." opens up new avenues for historians and anthropologists to explore. This is a subtle, powerful study of the deep horrors of slavery and the slave trade." The Frederick Douglass Book Prize was established in 1999 to stimulate scholarship in the field of slavery and abolition by honoring outstanding books. Previous winners were Ira Berlin and Philip D. Morgan in 1999; David Eltis, 2000; David Blight, 2001; Robert Harms and John Stauffer, 2002; James F. Brooks and Seymour Drescher, 2003; Jean Fagan Yellin, 2004; Laurent Dubois, 2005; Rebecca J. Scott, 2006, and Christopher Leslie Brown, 2007.
www.gilderlehrman.org and the quarterly online journal www.historynow.org. Text Source: The Gilder Lehrman Center for the Study of Slavery, Resistance, and Abolition Yale University. Some sentences were deleted from original text for the purpose brevity by CWL. Historian Sentenced For Stealing Lincoln Letter, reporting by Edith Honan; editing by Michelle Nichols and Xavier Briand, Reuters News Service, Sep 19, 2008. A U.S. historian who pleaded guilty to stealing letters written by former Presidents George Washington and Abraham Lincoln was sentenced to 18 months in prison on Friday. Edward Renehan, 52, pleaded guilty in May to one count of interstate transportation of stolen property and admitted stealing a March 1, 1840, letter by Lincoln and two letters dated August 9, 1791, and December 29, 1778, by Washington. The letters, part of the personal collection of former U.S. President Theodore Roosevelt, were taken from the Theodore Roosevelt Association. 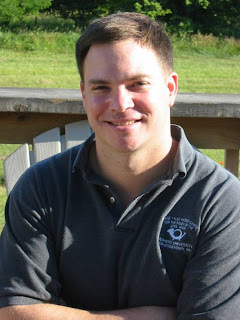 Renehan had been the acting director of the New York-based historical and cultural group. Renehan later sold the letters to a New York gallery for $97,000, the U.S. Attorney's Office in Manhattan said. Jim Bruns, head of the Roosevelt association, attended the sentencing at Manhattan federal court. He told reporters the letters were "not significant to the shaping of America," but were treasured by Roosevelt, who displayed them in his library. In sentencing Renehan, who faced a maximum of 10 years in prison, U.S. District Judge Denny Chin called the case "baffling." "By all accounts, Mr. Renehan is a pre-eminent historian and biographer, and yet he engaged in this stealing," said Chin. "It's really hard to understand. I'm not sure that I've heard a convincing explanation." Renehan, who has written six books including one on the Kennedys, said he has suffered from bipolar disorder, which at the time of the thefts, from 2005 to 2006, was undiagnosed. "At the time that I took those letters... I was on an extended manic episode," an emotional Renehan said in his plea for leniency. He was ordered to report to prison by January 2. Text Source: Thomson Reuters 2008. A sticky-fingered historian has 'fessed up to lifting two prized letters by George Washington and another by Abraham Lincoln and selling them for nearly $100,000. 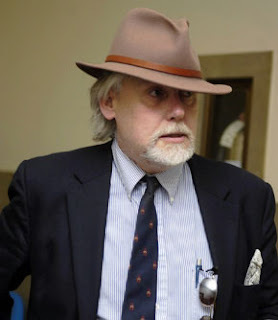 Edward Renehan, former director of the Theodore Roosevelt Association in Oyster Bay, LI, is facing 24 to 30 months in federal prison after pleading guilty yesterday to transporting stolen goods across state lines. The letters by Washington, dated 1778 and 1791, and Honest Abe, written in 1840, sold for $97,000 at a Manhattan gallery, according to court papers. The Lincoln letter was handwritten and signed more than 20 years before he became president. The Washington documents just carried his signature. While the contents of the letters have only minor historic significance to the presidents, they are rare and valuable, defense attorney Peter Brill said. Renehan, who has written six books, is also facing state charges in Nassau County for stealing a fourth letter from the association he once headed - this one by Roosevelt. In it, the 26th president, who kept a vacation home in Oyster Bay, discusses the death of his youngest son, Quentin, in 1918 during World War I. Brill said Renehan, 51, left his post as director of the association last year, before the thefts came to light, after he learned he had been suffering from a previously undiagnosed bipolar disorder. "This was a single aberrant act in an otherwise pretty impressive life," said Brill, adding that Renehan is a "very successful author" and had no pressing need for cash. "He takes full responsibility," Brill said. "It's just that in that state maybe you do things you wouldn't do if you were thinking clearly." Renehan is due in court on the state case on June 13 and faces a maximum sentence of seven years behind bars. "I suspect we'll try to work out a disposition that will cover everything," Brill said. The historian was arrested before he could sell the Roosevelt letter, which has been returned to the association. Renehan is well known in history circles, having penned books on Cornelius Vanderbilt and the Kennedy clan. He says on his online MySpace page that "biography" is his first love and that he is devoted to "green" politics and folk music, even claiming to have once sung with Pete Seeger. He admits to having bipolar disorder and says, "I continue to pick the shattered pieces from one of my last great expended hypomanias."